Mike Eckhaus and Zoe Latta outside the Whitney Museum, August 2018. I’ve gone to see “Heavenly Bodies“ at the Metropolitan Museum of Art twice and am likely to go again. I think it’s because when staring up at the pearl-inlaid, crush velvet, lace garments of my teenage idols Alexander McQueen, Christian LaCroix and Jean Paul Gaultier on pedestals I feel as if I’m in the presence of a being greater than myself—one that is as glamorous and powerful as it is untouchable. I found myself thinking about this aspirational gaze and the distance it introduces between body and garment while walking through Eckhaus Latta’s new Whitney solo show on a muggy August morning. It too is a fashion exhibition but one that does not seek space from its audience but rather embraces its viewers as a vital part of the act. Unlike the garments in “Heavenly Bodies,” many of which were whisked from a runway directly into an institution or archive, the capsule collection Zoe Latta and Mike Eckhaus created for “Possessed” is not only available for touching and trying on, but also for purchase as the show’s title suggests. “What is the difference between a retail space and an institution? How does the museum shop function? These questions were kind of the impetus for the show or rather how we set out to define the exhibition,” Eckhaus tells me over the phone during installation week. “We were curious to see how availability and accessibility could be established in these different spaces.” This includes commercially. To this end, Eckhaus and Latta have created a store within the gallery. The fully functioning boutique, which carries items priced from $5 and up, is staffed by a mixture of museum docents and the brand’s design team, and almost every object within it was created by an artist friend, including clothing racks by Annabeth Marks and Jeffrey Joyal, a display case by Martine Syms, mirrors by Valerie Keane and a changing room curtained off with Susan Cianciolo textiles. Installation view of “Eckhaus Latta: Possessed” (Whitney Museum of American Art, New York, August 3–October 8, 2018). Photo by Thomas McCarty. Their retail tableau has a set-like quality, an image which is reinforced by the final chamber, a theater with a wall of televisions streaming live and archived clips of Eckhaus Latta and their stockists. 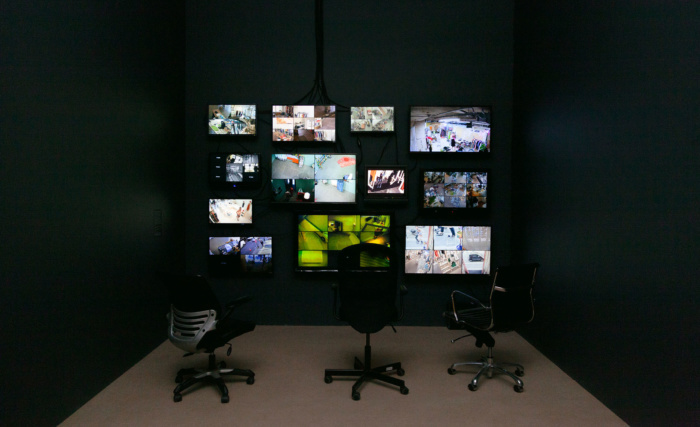 One screen pipes in footage from the show drawing attention to shopping’s entanglement with privacy and security. After watching others shop for a while, I reemerged more self-conscious of my performance as both client and museum-goer and wonder how these roles might serve as illuminating foils for one another. The show certainly seems to have served as an important evolution for the brand. By transforming their solo show into a boutique and their boutique into a group show, Eckhaus Latta evade the age old question, “Is it fashion or art?” and locate their practice in an ever-growing grey area populated by a generation of artists and designers who are less and less interested in accepting the market’s rituals as rule. Perhaps we are all a little more discerning even as consumers thanks to our endless exposure to marketing in both our public and private lives. How can institutions and retail space make room for these changes? How can retail be more intimate? How can institutions be more inclusive? Eckhaus Latta doesn’t have the answers but that doesn’t stop them from experimenting. “Even though they both require a lot of moving parts organizing a fashion show is really different than putting together an exhibition,” Latta says. “Doing this with a museum provided us with a scaffolding we normally don’t have for our projects. As a result, we were able to make some garments we’ve been dreaming about for a long time but never had the time or resources to make.” Like the designers of “Heavenly Bodies,” Eckhaus Latta is in favor of fantasy but with the added bonus of arriving all together.